Wildly successful Brit Chefs and brothers take time out from their restaurant empire to whip up a tasty Club Sandwich. That's Jeff on the left with Chris. Editor’s note: Each month, British Airways popular “Club” magazine publishes as a regular feature a club sandwich recipe contributed by a world class chef. BA is kind to share the recipe with bloggers. In its December 2016, “Club Magazine” featured Chefs Jeff and Chris Gavin. 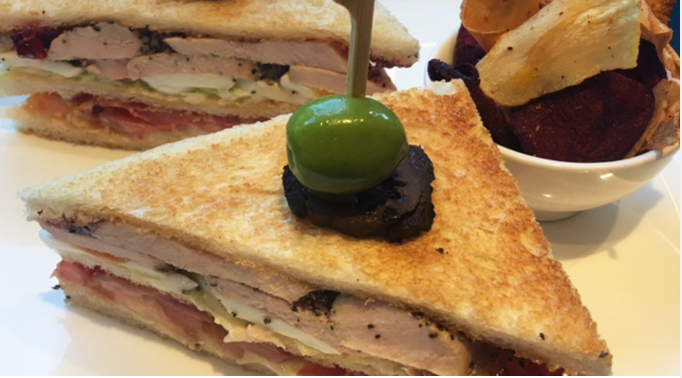 Sadly, the Galvin’s Club sandwich is the final in a long series of club sandwiches created by famous chefs. It was a tasty run whilst in lasted. 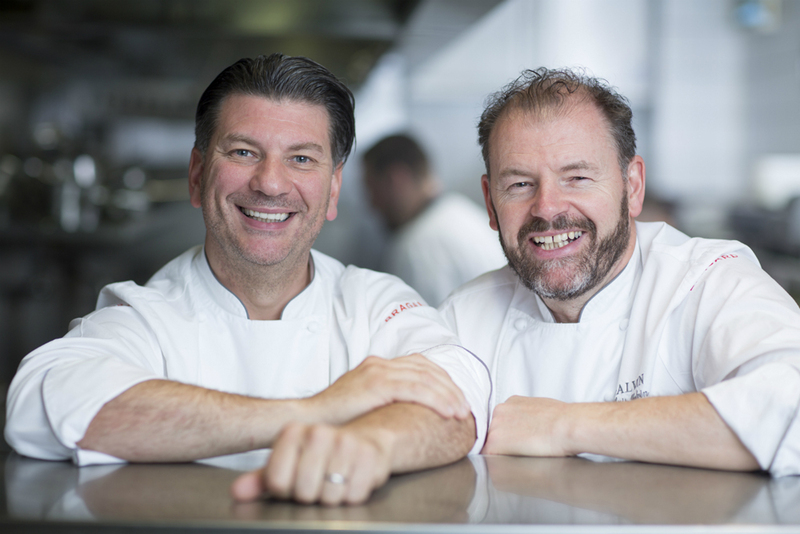 Brothers Jeff and Chris Galvin have created a foodie empire in London with their high-quality French bistro restaurants, winning a Michelin star along the way. Here, Chris tells Club magazine why he’s a fan of the room-service staple, and shares the brother’s festive twist on the sandwich, complete with turkey pastrami and pickled walnuts. I made a lot of Club Sandwiches when I worked at The Ritz. At the time, the hotel was owned by the Cunard Line, and whenever the QE2 docked at Southampton, there would be an influx of orders for Club Sandwiches from travellers staying at the hotel. It was the same whenever the British Airways Concorde landed in London from New York. The secret to the sandwich’s success was always to use freshly boiled, free-range eggs, and chicken poached in copper stockpots. These pots are great for cooking something long and slow for an even poaching. Jeff and I are big fans of the Club Sandwich. It’s a timeless classic and the perfect pick-me-up when travelling. I’ve eaten them everywhere from Berlin to Ile de Ré. Chris and Jeff recently opened their first restaurant outside a major city – Galvin at Centurion – in St Albans. The Hertfordshire countryside retreat (which is just a 20-minute train ride from St Pancras) serves the laidback but expertly executed French cuisine, which has earned the brothers their Michelin stars. 1. Season the chicken breast with the salt, pepper and thyme, then rub 1. Toast the bread and spread butter on both sides. 2. Mix the lettuce and mayonnaise together and spread evenly onto two of the slices of toast. 3. Top one slice with the bacon and tomato, and the other with the turkey pastrami, sliced egg and cranberry jelly. 4. Stack both pieces of toast on top of one another, top with the final slice of toast, and trim off the crusts. 5. Slice that sandwich in half into triangles. Put the pickled walnut and olive through each skewer, and attach to each piece of sandwich. Serve with a side of mixed-leaf salad and vegetable crisps.